Every Monday night—at least through January 2011—there are three flights that leave Faleolo International Airport (APW): one to Los Angeles, one to Fiji, and one to Auckland. There are a bunch of other flights to Fiji and Auckland, but Monday still ends up being central in terms of departure dates. For group 81, this means weekly departures scheduled between 15 November and 20 December. This week we have a bye, but I’m staying in Goodbye Mode anyway because the Indian Missionaries leave for the connection in Fiji tonight. Their departure provided a strange preview of what my own goodbye will look like. As soon as I arrived on campus this morning, there was a rush to finish the list of awardees for next week’s Prizegiving. Somehow the fact that I and the Indian Missionaries are not Samoan gives us an air of impartiality in deciding which students should be awarded prizes. I don’t necessarily agree with this perception, but I agreed to take on the responsibility if only because it meant I got to make flashy Excel spreadsheets. Once the list was checked and re-checked, and everyone was satisfied with the list, it was time for Interval. It’s funny how 2 years ago I may have missed the subtle hints that seating at luncheons like today’s was special. I knew the Indian Missionaries were leaving today, and I figured there would be some sort of program at our staff meeting, but I maintain there were still subtle, subconscious cues that helped the event run smoothly. Thanpuii made a speech in which she thanked the staff on behalf of her, Apong, and Maengi, and she apologized for any shortcomings or faults. After 9 years of living here, Thapuii and Maengi know the drill. Then our staff sang a goodbye song. Tolo, the other computer teacher, accompanied on guitar, and staff around the room swayed to and fro. A few times it sounded like the song had ended, and then a teacher—twice Peteru, once Tuuau—called out the beginning of the next verse, and the room broke out into song once more. I admit I had to hold back tears, which doesn’t bode well for my own goodbye. I’m going to be a mess. I wanted to give gifts, though I hadn’t purchased anything. But as it turns out, I have a house full of stuff I’m looking to give away in the next 2 weeks, so I went shopping in my kitchen and bedroom. For Maengi, my small wok and my tea kettle (she’d asked for these). For Thanpuii, my mini MagLite I never opened in my 2 years here. For Apong, my electric guitar tuner. And for everyone—I admit this was a little bizarre—an Australian keychain! I bought a bunch in Sydney in January, and they’ve been collecting dust in my bedroom ever since. Oh well. Better late than never. Dan and Jordan leave next Monday night. And then a week after that, me and Phil. We’re down to the wire. I hope you’re well. Pictures below! 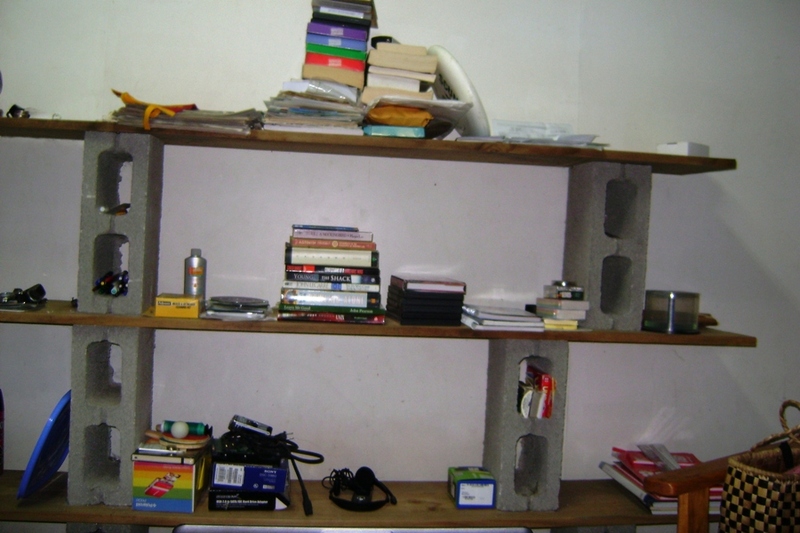 My shelf has become pretty bare with books and DVDs going to the Peace Corps office and papers going to recycling. Maengi and I took pictures tonight before we said goodbye. Oh my goodness I can't believe you are actually leaving Samoa and I am feeling for you! I lived in Samoa last year and can relate on some levels with what you are saying. I wish I could have met you before you leave Samoa but sadly I will get there too late. I look forward to the rest of your entries and wish you the best for the rest of your time there.